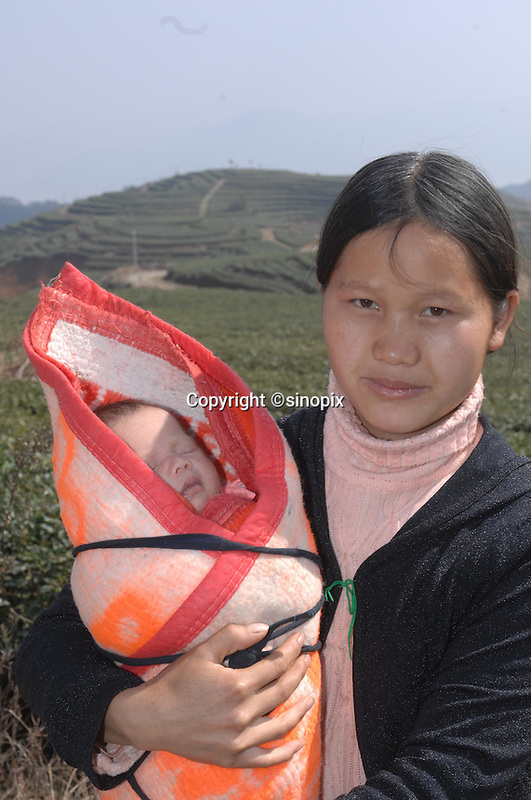 Xiong Guang Mei, 24, with her 20 days old baby boy, Jia Heng, who was born at the plantation, and spends his days strapped to her back when she is working at The Tian Hu (Sky Lake) Tea Farm in the mountains outside Fuding City, Fujian Province where "Silver Tip" tea is produced. Workers here are paid around 53 pounds a month during harvest season, they work ten hour days, seven days a week and the women work with the children strapped to their backs. The tea sells for upto 20 pounds a pot in the UK.